Platinum, Gold, and Silver remain steady this week despite the seemingly endless downward trend in the world market for industrial, automotive, and logistics industry. The sudden rise in the price of oil opened the week with an announcement from an independent oil company to hike the price of its gasoline and diesel between 20 to 50 centavos per liter while commuters demand that fare should be lowered by 1-peso due to the ample reduction in the prices of fuel. The local financial market is in a somber mood after some still unnamed preneed firms were disclosed by the Securities in Exchange Commission (SEC) to suffer the same fate as the defunct Legacy Plans. Preneed firm Pryce Plans Inc. remains solvent and liquid though it is barely able to pay planholders in cash owing to trust fund illiquidity, data from the Securities and Exchange Commission showed. In a letter to Sentaor Mar Roxas, Jose Aquino, SEC director for Non-Traditional Securities and Instruments department, said Pryce Plans trustees ChinaBank and Asiatrust Bank informed the SEC of the trust funds’ illiquidity. The SEC also noted that Pryce Plans has a trust fund deficiency of P56.17 million since it only has reserves of P113.23 million consisting of listed equities and a little cash as against the required 20 percent reserve of P168.4 million. Aquino noted that the firm has chosen to deal with its maturing obligations to holders and surrendered plans by giving them the option to avail of the cash settlement or dacion en pago, provided the consent of the availing planholder is secured. The dacion is by way of liquefied petroleum gas from sister company Pryce Gases Inc., medicine from another sister company Pryce Pharmaceuticals Inc., and memorial lots provided by other Pryce companies. For those availing the swapping option, their maturity benefits are in effect converted into capital for dealership of liquefied petroleum gas or medicines which are given immediately to them upon signification of their assent. However, for those availing the settlement mode by way of cash, the SEC said Pryce Plans is implementing a queuing program due to the illiquidity of the assets of its trust fund. Pryce Plans has assets of P1.28 billion as of the end of 2008 as against total liabilities of P974.56 million. The firms assets have dwindled by 31.7 percent from 2004 when its total assets amounted to P1.87 billion. As of the end of 2008, Pryce Plans trustee banks reported a total trust fund equity of P846.99 million, of which P590.73 million is for educational plans while P256.26 million is for Pension plans. However, the cash portion of these trust funds amounted to only P106,839.00 or a mere 0.01 percent of total trust fund. This is because the bulk of these trust funds have been invested in real estate, primarily condominium units (P518.45 million), and memorial lots (P216.84 million) as well as some in listed equities (P113.12 million). 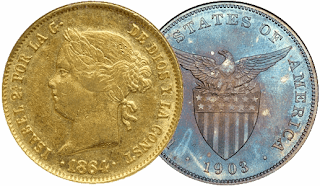 Meanwhile, local coin dealers are experiencing the pressure from the rising demand of bullion coins as the price of precious metals became apparently toward the upward trend. Mostly sought after, are crown size coins like the United States and Philippine Peso and the Spanish 8 Reales. Recently, the price of the small peso bullion climbed to P350 from its previous worth of P220 to P250 last month.